Arabic is the sixth most spoken language in the world with approximately 195 million native speakers throughout the Muslim world. It belongs to the Semitic group of languages which also include Hebrew an Amaharic, the main language of Ethiopia. Systran has just released Arabic Translation Software! 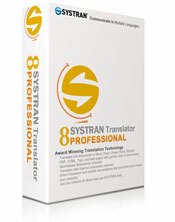 Translating Arabic is easy with Systran software. This software is very easy to use and has many custom features that help to make the software even more accurate as you customize it for your specific translation needs. 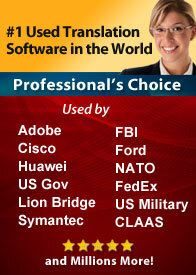 Translate large files, build additional dictionaries, built in spell check, alternate meanings and more. 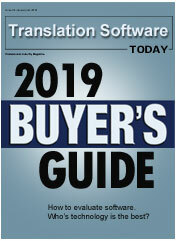 Easy-to-use translation software for the daily multilingual needs of small businesses. All the features found in the Essentials version plus advanced tools allowing you to train the software for increased productivity and accuracy. Also includes 21 additional industry specific dictionaries with thousands of terms. Computers, Medical, Legal and more. Additional Accuracy over the basic Essentials Version. There are many Arabic dialects but two of the most important are Classical Arabic dialect–the language of the Qur'an, (originally the dialect of Mecca in what is now Saudi Arabia) and an adapted form of this, known as Modern Standard Arabic. When it comes to the translation of Arabic text it uses "Modern Standard Written Arabic" this is the form used in books, newspapers and official documents . In conversation between educated Arabs from different countries (for example at international conferences and the United Nations) they may speak different dialects but the standard for the text is the "written" form which gives us a standard for translation. Systran uses this written form the Arabic to English and English to Arabic conversion. When working with translating software you can localize the translations by adding words and phrases to the dictionaries that can help increase the accuracy for your audience. In translating Arabic you should learn the sentence structure. The normal word order of a sentence is verb / subject / object. In Arabic, the adjective follows the noun it describes. The function of nouns in a sentence can also be distinguished by case-endings (marks above the last letter of a word) but these are usually found only in the Qur'an or school textbooks. Arabic uses five specific prepositions as verbs; the right order is preposition / noun / verb. This preposition is a verb with tense (past/present/future). In Arabic, a word is classified as one of three: a noun, a verb, and a preposition. There are simply no separate categories for adjectives, adverbs, etc. ; all are fulfilled by either a noun or a verb, or in some cases, a preposition. For example, to say in Arabic the sentence "the man ran slowly", one would say in Arabic a sentence whose word-for-word translation is "the man ran with slowness", or "the man ran (with) a slowness". Similarly, the Arabic word for "quick" would be treated as a noun, thus it is more properly translated not as the English word "quick", but as the English phrase "quick one". Arabic uses an alphabetic system normally using symbols for only consonants and long vowels. There is a fairly close match between the written symbols and their phonemic, or linguistic function. Short vowels are typically not written even though much morphological and grammatical meaning is signaled by vowels. Because only roots and stems of an inflected word are written the reader has to infer its particular meaning from context. When vowels are symbolized, as in children's books or learners' manuals, super- and subscript diacritics are used. Nouns in Arabic are either "masculine" or "feminine" in gender. You can usually tell if a noun if masculine or feminine by the ending, for example, most of the feminine nouns end with an "-ah" sound. There are exceptions to the rule therefore some proper nouns you will need to memorize to help figure out if they are masculine or feminine. An adjective must "agree" in gender with the noun it describes: If the noun is masculine, the adjective must be masculine. If the noun is feminine, the adjective must be feminine. You make the adjective feminine by adding the "-ah" sound at the end. When you are doing English to Arabic conversion you will need to see the actual foreign language fonts. You can configure Microsoft windows to display Arabic fonts by changing your language settings. How to enable Arabic Fonts in Windows. Arabic is written from right to left in a horizontal form. Arabic writing sits on the line. There are no capital letters in Arabic. Punctuation is similar to English except for comas which sit on the line instead of under the line. Arabic uses gender for all known nouns, no neutral ones. Space is left between words in a sentence. Some letters change shape depending on whether they are at the start, in the middle or at the end of the word. There are 29 letters in Arabic - with 3 letter sounds which do not even exist in the English language. Arabic does not distinguish between vowels and consonants; the use of a small sign on the top or under the letter indicates the pronunciation. Arabic is one of the top ten languages spoken in the world. With the recent events in the Middle East the demand for translating Arabic has increased dramatically. 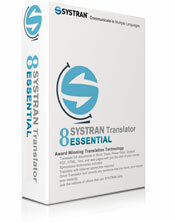 Many companies such as Systran immediately made Arabic translation a priority. “Linguistics technology is beginning to play an increasingly important role when it comes to ensuring national security. Because of the enormous volume of multilingual intelligence information that must be analyzed with limited human resources, technologies that can assist in sifting, sorting, and finding critical information are essential in ensuring that threats are detected as quickly as possible. Whereas the US Government cannot endorse any one product over another, we are pleased to see that companies are responding to the government’s call for solutions to these difficult issues.”Everette Jordan, Director the National Virtual Translation Center, an organization jointly sponsored by the FBI and CIA under the USA Patriot Act. Commerce between the U.S. and many Middle Eastern Countries is growing daily. Recently the USA signed a free trade agreement with Jordan and is negotiating similar agreements with other Arab countries: Morocco, Egypt, and Bahrain.